Anyone on the road or on the go can view live and on-demand HD video from any computer - and now on mobile devices: iPad®, iPhone® or iPod®. Your mobile device connects to LifeSize Video Center via Wi-Fi or cellular network with no apps to install. Be Everywhere. Live… or On Demand. LifeSize® Video Center is the world’s most powerful one button HD streaming, recording and auto-publishing solution. Share knowledge and communicate business-critical information via video, audio and data streaming. This single appliance solution ensures that live and on-demand videos are easily accessible from any location and on more devices—including the iPhone®, iPad® and iPod®. 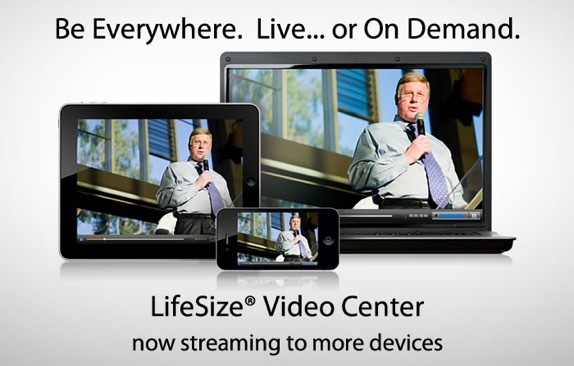 LifeSize Video Center supports an unrivaled number of concurrent recordings, on-demand streams, and simultaneous live streams, all in 720p30 HD video. Record and broadcast executive updates, business presentations, sales meetings, training sessions, data or diagrams to anywhere in the world. Integrated with LifeSize video conferencing systems, streaming HD quality video to hundreds of viewers is as simple as pushing a single button. With automatic adaptive streaming, live and on-demand videos are optimized for every viewer—PC, laptop, tablet or phone. The viewing device automatically selects the best playback rate based on network conditions, thus ensuring a quality viewing experience without delays or buffering, even on the smallest devices. LifeSize Video Center makes life easier for IT administrators, who can add users and create recording keys so that authors can auto-publish content independently. Integration with Active Directory simplifies user and group management, and a built-in reporting feature gives insight into user viewing patterns. LifeSize Video Center scales to enterprise needs through support for NAS (Network Attached Storage), greatly extending storage capacity within existing IT assets. LifeSize Video Center now offers API (Application Programming Interface) support, which means that customers can integrate LifeSize Video Center with various enterprise applications and educational institutions can integrate Video Center within their learning management system (LMS). LifeSize® Video Center. Be Everywhere. Live…or On Demand.